Combines the world’s fastest photo scanning hardware with Mac and PC software that makes it easy to enhance and organize decades of precious memories in the time it takes to press a button. It’s a tedious task to take your old photos in an album or box and convert them to a digital format by using a scanner. In recent years, mobile apps like Unfade, Photomyne, and Pic Scanner have taken some of the friction out of this process by automatically cropping, enhancing, and organizing prints. But those apps share a singular limitation: No matter how good the smartphone camera, it can’t compete with a decent hardware scanner. Epson’s new FastFoto FF-640 ($650; available on Amazon) offers a higher quality approach, combining sheet-fed duplex color scanner hardware capable of 600 dpi optical resolution with Mac and PC software for organizing and enhancing photos in a single step, optionally restoring faded colors, removing red eye, or adjusting brightness, contrast, and saturation. 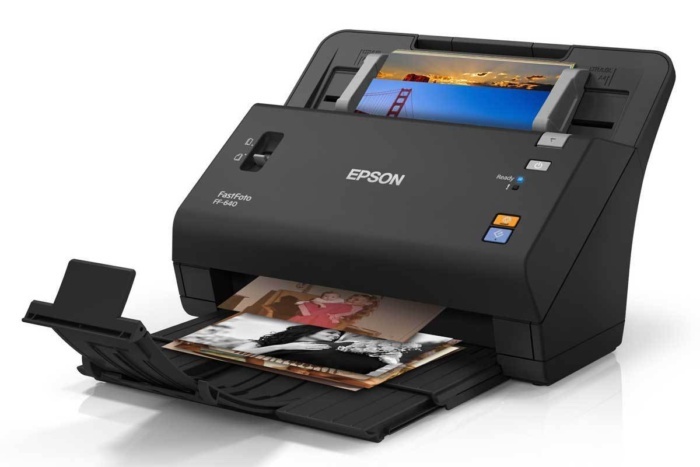 The real beauty of the Epson FF-640 photo scanner is the FastFoto software, which dramatically reduces the amount of time spent organizing scanned prints. 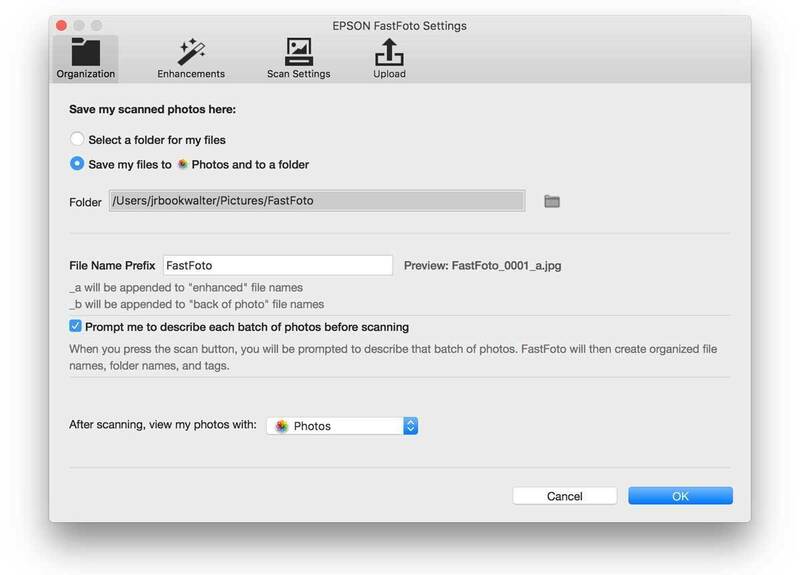 When you initiate a scan by pressing the blue button on the front, FastFoto prompts you to enter a year, month, and a brief description for each batch of photos. This information is used for the resulting filename, as well as storing tags and metadata to automatically organize scans into the proper date in your library timeline. You can even grab handwritten descriptions from the back of prints in a single pass; those are saved as a separate image. After scanning, you can add more photos to the same batch or view results from the Finder, Preview, or Photos. As an iCloud Photo Library user, my favorite feature is how FastFoto can be configured to automatically import batches into Photos, so scanned images are then synced to all my devices within moments. Scans are also saved to the Pictures folder, so if you’re all-in with Photos like I am, you’ll want to manually purge these unwanted duplicates after each session. 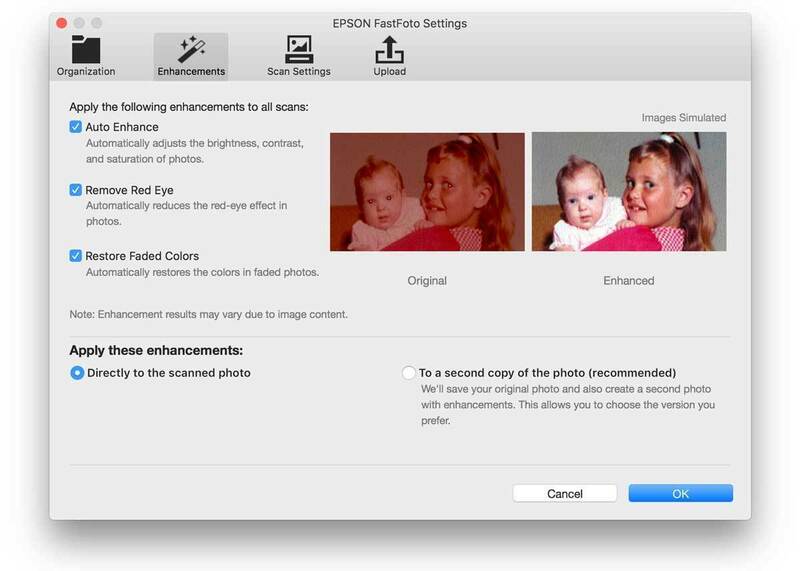 The FastFoto software can optionally auto-enhance, remove red eye, or restore faded colors from prints as they’re scanned. With the FastFoto FF-640, scanning stacks of old prints is not only more fun, but can now be done in record time. Hardware and software is intuitive and easy to use — I never consulted the user manual even once — but there are a few things that make the experience a little less magical than it could be. First is the price: At $650, the FF-640 is more expensive than the similarly-sized Fujitsu ScanSnap iX500 ($495), my favorite document scanner. (To be fair, photos are a weak spot on ScanSnap.) Epson’s build quality isn’t as good as the iX500; the FF-640 offers the same chintzy plastic construction as recent all-in-one printers like the WorkForce Pro WP-4530 (which I also own). FastFoto also requires a wired USB connection to your Mac or PC. There’s no wireless mode, which means no scanning to companion mobile apps or direct to the cloud; you can connect Dropbox and Google Drive accounts to automatically upload scans as they’re made. The FF-640 also works as a decent document scanner for creating searchable PDF files from up to 80 pages at once from your favorite software or the included Epson Document Capture. Cost aside, the FF-640’s biggest weakness is the frequent need to clean the scanner bed. Even after wiping prints with the included cleaning cloth prior to scanning, the resulting images often displayed vertical white lines resembling scratches, which appear to be caused by residual dirt on the rollers. 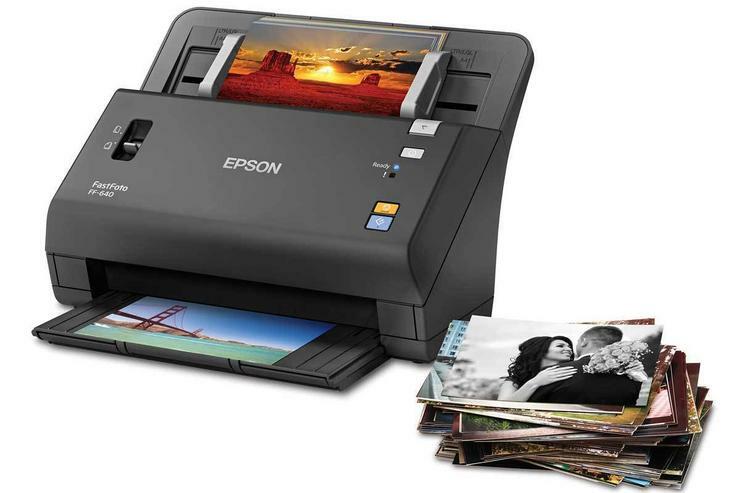 Epson FastFoto FF-640 scans up to 30 prints in a single batch, complete with any handwritten notes on the back of each photo. If you have boxes of old photo prints and can’t commit to the time it takes converting them to digital, Epson FastFoto FF-640 makes the process effortless and fun, but you’ll pay a premium for the convenience.